Since it was founded in 2004, Hautlence has continually reinvented ways of displaying the time, delighting in incorporating complications to add variety. With the HLNewton model, the Neuchâtel brand has added a new calibre to its collection, featuring an idiosyncratic reworking of the jumping hour mechanism that introduces a new time display principle. Using a system based on gravitational force, the HL Newton indicates the time only when required. The watch enters mechanical standby mode whenever the passing minutes are of no interest. A watch that indicates the time only when required, allowing the wearer to forget about it the rest of the time: Hautlence presents the HL Newton. Equipped with a new self-winding manufacture calibre, this piece uses the jumping hour principle, with the caveat that the usual criteria have been entirely revisited by the Neuchâtel brand. Instead of the hour jumping in a static window, Hautlence opted for a moving window that approaches the hour numeral. It all happens under the effect of gravity, using a mobile window supported on three bearings with an off-centre weight. On a mechanical level, a central wheel skeletonised in the form of the famous Moebius symbol, drives the blued minute hand, which is tipped with a white arrow. It also actuates the silvered opaline disc featuring the skeletonised hours. While the hours and minutes follow their inexorable trajectory, a mobile central flange with a blue DLC coating is driven by a snail, which performs a full revolution every 60 minutes. This weighted flange, which bears the brand's logo, features the minute track numerals and a window that displays the time, when desired by the wearer. The flange then moves to the correct location, bringing the window to the hour and the minute track opposite the hand. The movement is gentle, thanks to a brake that prevents shocks. When the wrist is in a random position, the time is not visible and the minute track is out of phase with the minute hand's travel. It is Hautlence's mechanical version of the sleep mode found on connected watches, in an affectionate nod characteristic of the company. The HL Newton model features the TV screen shape so dear to Hautlence. The titanium case has been specially reworked for these pieces, reinterpreting the brand's signature codes. Enlarged and equipped with a wider opening on the dial, it truly show cases the complication while preserving the harmonious proportions. 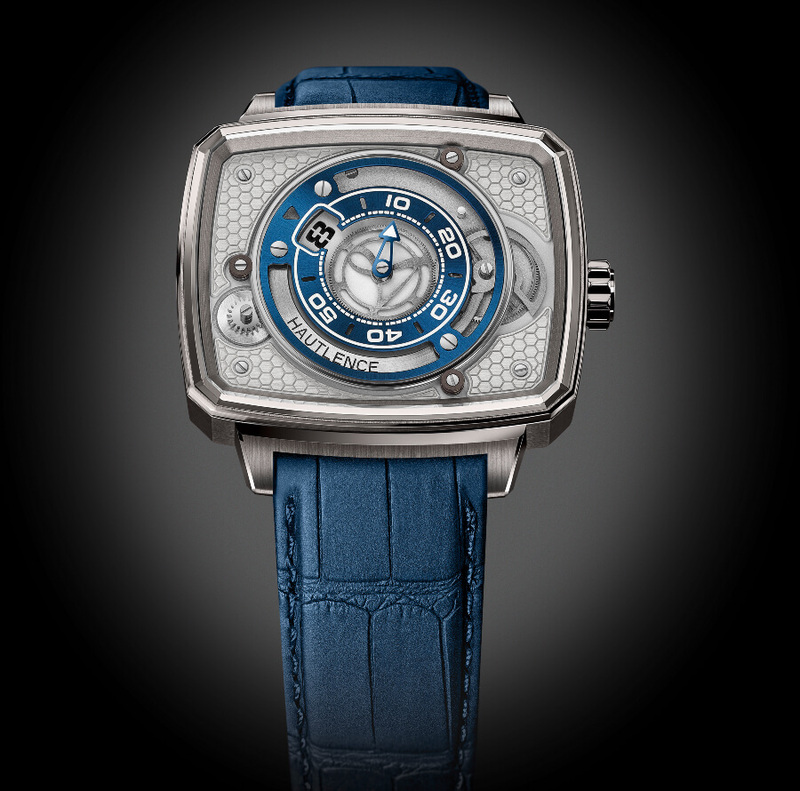 The fluted crown is made from titanium and bears the engraved Hautlence logo. The opaline base dial is equipped with silvered inserts engraved with the brand's characteristic Honeycomb pattern, which adds a second layer to the dial. 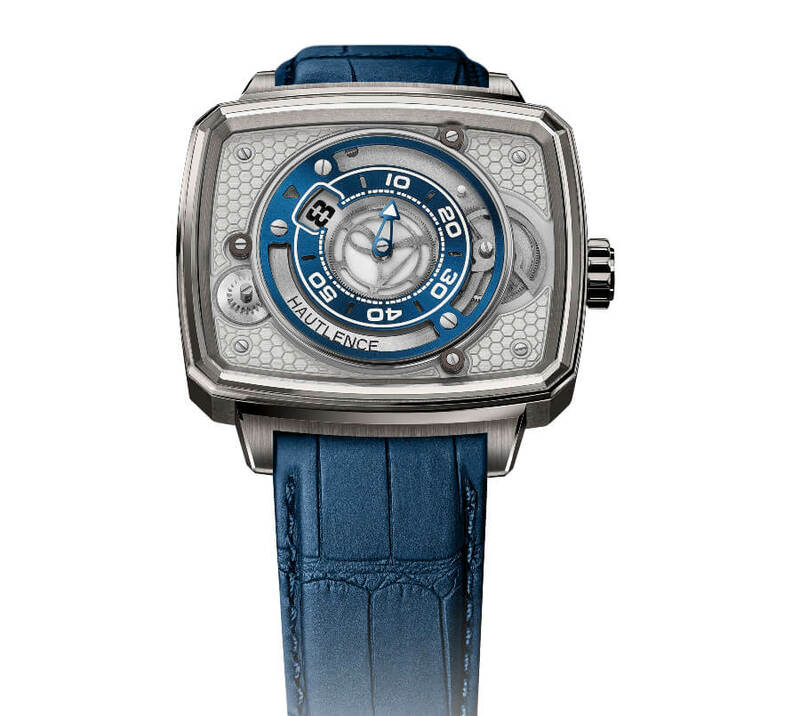 An alligator leather strap with full square scales in the same shade of blue as the mobile window adds the finishing touch. The result is a very fine Hautlence watch, issued in a limited edition of 28 pieces, featuring a brand new take on the jumping hour. · Jumping hours using a gravitational on-demand time display, with the minutes on a 330°sector Self-winding mechanical movement. Display: Jumping hours in a mobile window, minutes on a mobile flange, 330° sector. · Hours and minutes, self-winding mechanical movement. · Dimensions:39 x 46 x 12 mm. · Silvered opaline hour disc with skeletonised numerals. · Mobile window with blue DLC, white transfer minute numerals. · Folding clasp: titanium with satin-finished steel plate. 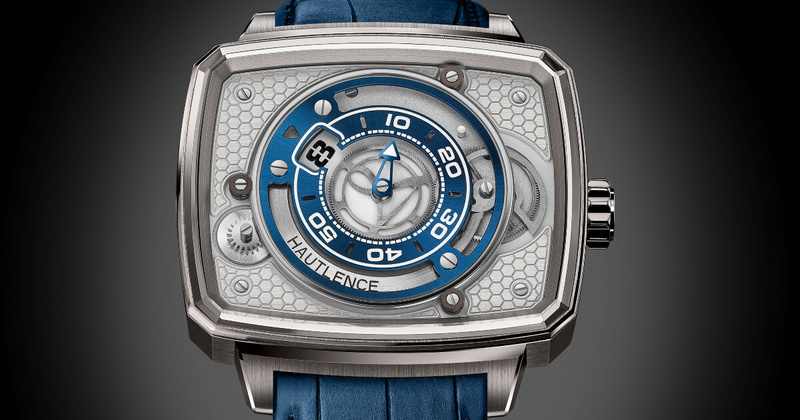 The price for the Hautlence HL Newton 01 is 24,900 CHF- including tax. For more information visit Hautlence Online.